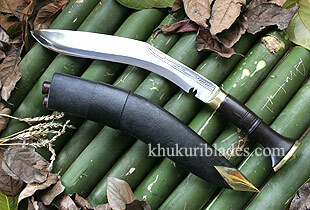 "Sirupate" the name of a leaf found in the hilly region of Nepal is where this kukri gets it name from. This leaf which is slim, long and sharp has influenced farmers towards making of this kukri. The same features are given in this kukri, its slim in spine making it lighter, long for longer reach and always kept sharp. It is designed for daily household purposes. The effortlessness, easiness and effectiveness of Sirupate make this knife so special. It is very renowned among Nepalese. It is much longer and bit slimmer than the army types.